It wasn’t long ago when I thought that Kingdom Hearts 2 was the best game I have ever played, but even to this day the game is one of the best that I have ever played on any platform. Kingdom Hearts 2 was the game that transformed gaming for me for the first time in years. The storyline of kingdom hearts is so unique. I love the new combat system that took the place of the first kingdom hearts game. best games that I will have ever played. The storyline in Kingdom hearts 2 is really good. I liked how Square Enix, the developer, made the beginning of the story take place in Sora’s alternate body, Roxas. I found it interesting how I could play as him and see how he lived his life in his own home town, twilight town. The best part of the storyline to me is when Sora and Kairi, his lover, meet after being apart from each other for so long. Kingdom Hearts 2. The best feature that was added to Kingdom hearts 2 was the use of forms. When I found out that I could wield two key blades at once, it changed the game so much because I got to fight differently in a way that I couldn’t before. the ones form the first Kingdom hearts. The new key blades were not as good as the ones I the first game. The new look of the key blades didn’t interest me either liked the ones form the first kingdom hearts because they looked much better and added more attribute bonuses. The new combat system is amazing. Before Sora could not spin around and do flip sin the air. hit. I also like the new way that Sora attacks. He not only attacks faster but with more force, and the hits look a lot better too. Kingdom Hearts 2 is so good in graphics, story, and just the overall feel compared to Kingdom Hearts one. It makes me feel like I’m in the game fighting myself, and that’s when at I want to feel from all my games. It is one of the best Role playing games that I have ever played, and it will always be a classic game to play due to its highly integrated storyline and battles. Kingdom Hearts 2 holds a special place in my heart , I got this game when i was 7 and till this day , I still love playing it’s HD Remix version on my PS3 . I can say that i completed the game at least 10 times , although its not much of a deal , the story is what makes this game so unique . This game is a huge upgrade from its prequel , especially the "Skip Scene" option added that made my life easier to skip some long scenes that i already watched. Mashup of heroes from the Final Fantasy series and Disney too is awesome in my opinion, and heck they even placed Sephiroth into the game as a boss that became one of the hardest in the game. The story holds many different elements of surprise and deep meanings , I understand nothing during my first gameplay and I understand more and more by replaying the game. 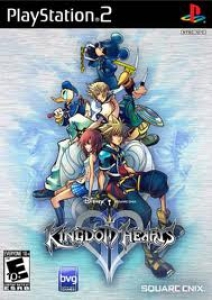 Kingdom Hearts 2 no doubt , it’s the best RPG game i ever played in my PS2/PS3 . Still waiting for Kingdom Hearts 3 tho. Cant agree more , it’s my favourite game on the ps2 as well.